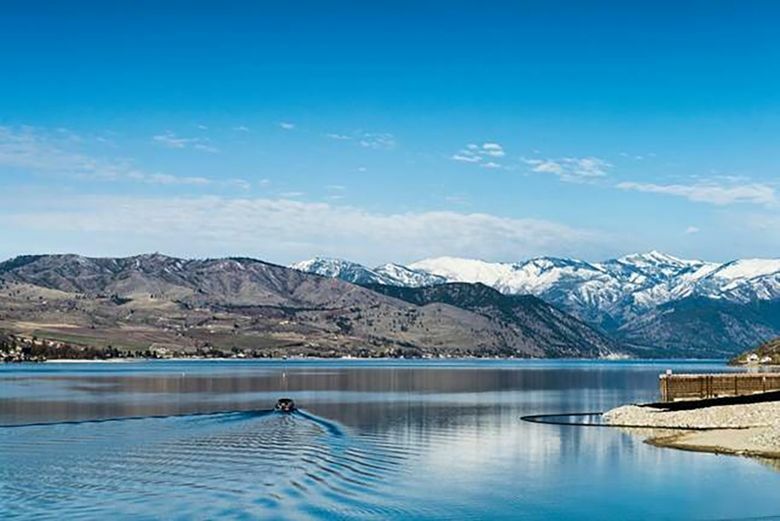 Here are four ideas to take with you on your exploration of the Lake Chelan region. Mist hugs white-topped peaks, then slowly lifts like layers of blankets. 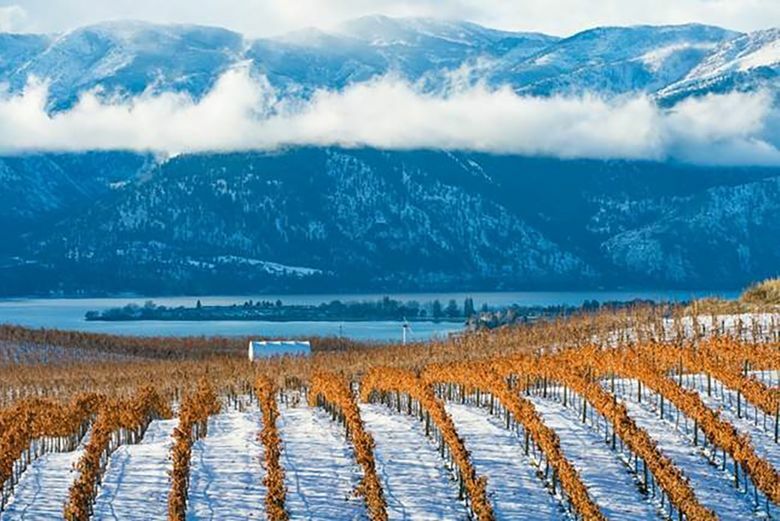 Lake Chelan’s bright blue waters reflect sunny skies, while delicate snow wraps vines in hibernation. After all, there are 300 days of sun annually in Chelan, so winter is an enchanting time of year to appreciate the glacier-fed lake surrounded by sparkling snow. Summer’s crowds have vanished – yet those in the know can still escape into serene beauty and chill out. 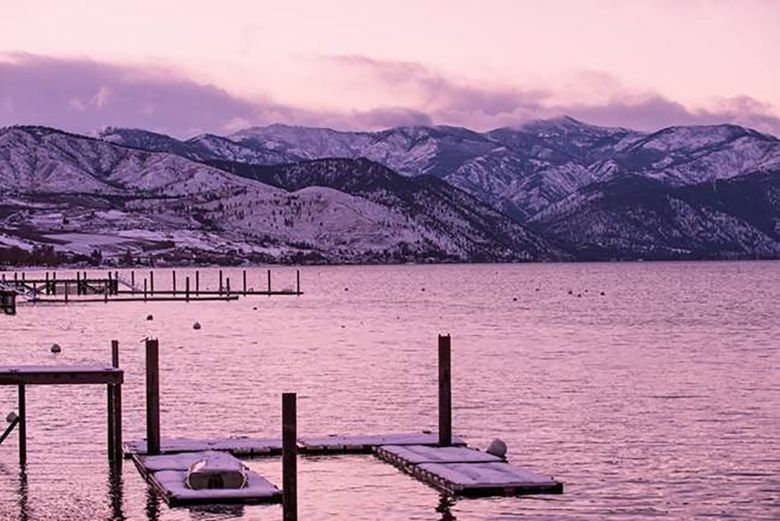 “It’s like a best-kept winter secret,” says Seattle resident Cindi Tigges, who recently visited Lake Chelan for the first time, while attending a women’s retreat. “I had no idea how beautiful it was.” Even the three-hour drive was spectacular, she says, along a landscape patchwork of crops at rest. 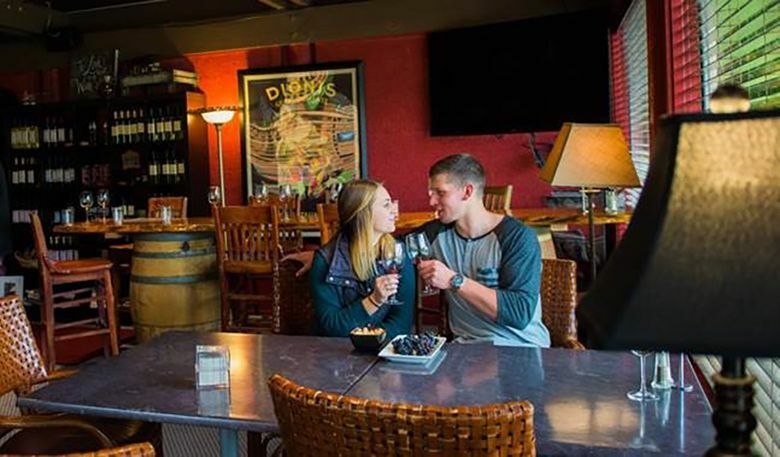 Tigges went on long walks along snowshoe-designated trails, and enjoyed stopping in at local wineries, where firepits and outdoor heaters keep sippers well-warmed. “There are gorgeous ice-covered lakes and mountains, and it’s nice to sit by the fire and just relax. It was very quiet and peaceful,” Tigges says. Enjoy a leisurely breakfast in your hotel or B&B, then bundle up to enjoy wine country via a car service. 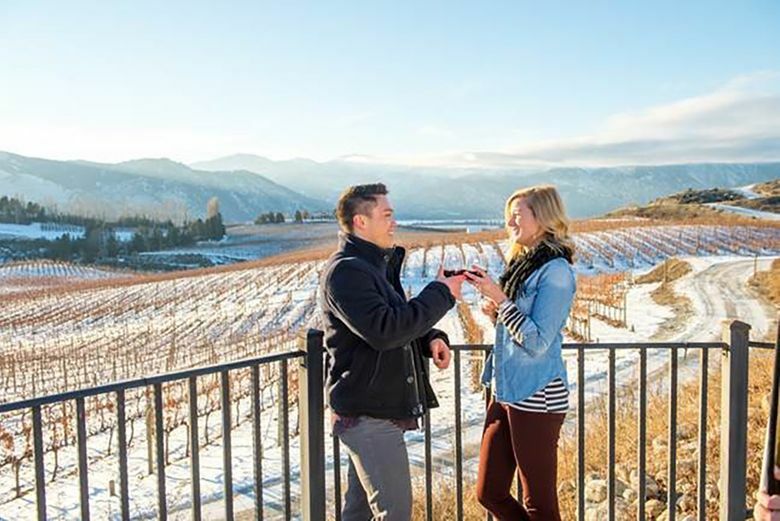 The Lake Chelan viticultural area boasts more than 30 tasting rooms open year-round, with winemakers on hand to spill the secrets of their reds and whites. Many wineries offer spectacular views that pair with a pinot. After you’ve selected a favorite bottle, head back to your hotel for a couples’ massage at one of the area’s spas or wellness studios. Transport yourself via limousine to a gourmet dinner at one of the town’s many restaurants, next to a smoldering fireplace. Then go for a quiet walk under a pinpoint-clear starry night. Don warm winter gear and head into Chelan and Manson’s walkable streets for shopping, dining and entertainment. Check out some live music or discover the area’s history at the Lake Chelan Historical Society. Visit historic downtown Chelan along Main Street and pick up books, apparel, outdoor wear, upscale gifts and pampering items and crafty things. Antiques, chocolates and more are available, but don’t miss the murals and sculptures, which showcase the town’s commitment to the arts. In the evening, catch a community theater performance or a low-key café jazz jam. On Mondays, Wednesdays and Fridays, pack books and a picnic, then board ferry “Lady of the Lake,” which for four hours, plies the third-deepest lake in the U.S., stopping at small towns only accessible by boat. Soon, arrive at the petite burg of Stehekin, and for the next 90 minutes, amble amid wood-frame buildings and visitor center, enjoy lunch and a mesmerizing perspective of sky and scenery, a quiet moment of respite. Bring binoculars to spot birds year-round amid the boughs. Then board your ferry (almost as good as a flying carpet) back to Chelan. 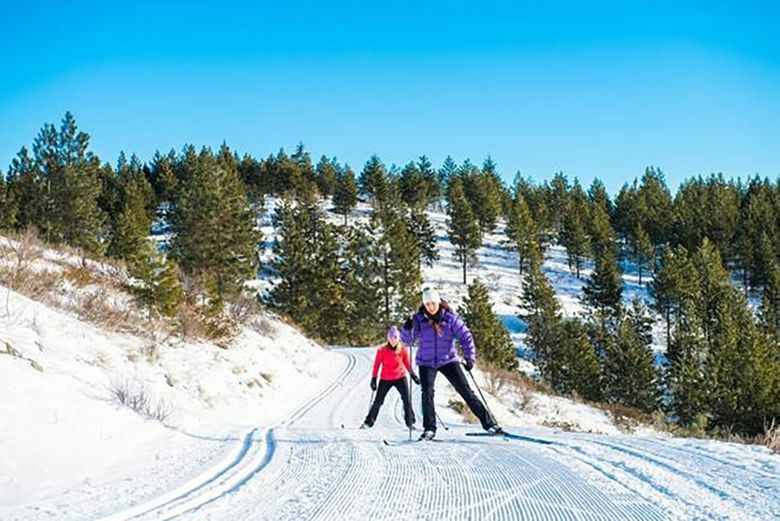 Slip on skis for cross-country glides through groomed countryside trails at Echo Ridge Nordic Ski Area, a professionally designed system with 32 kilometers of trails for all ability levels. Trails take you through scenic ridgetop views via classic skiing, skate skiing and single-track backcountry quests. Or tack on snowshoes for a loop of almost four kilometers. Rent a snowmobile for Lake Chelan’s 170 miles of groomed trails under sunny skies, stopping off at warming huts for a cup of cocoa, or to take in views from Cooper Mountain. Downhill skiing, tubing and snowboarding can be found at Echo Valley Ski Area, minutes from downtown Chelan. End the day with a cider tapped from one of the region’s heirloom apple varieties.